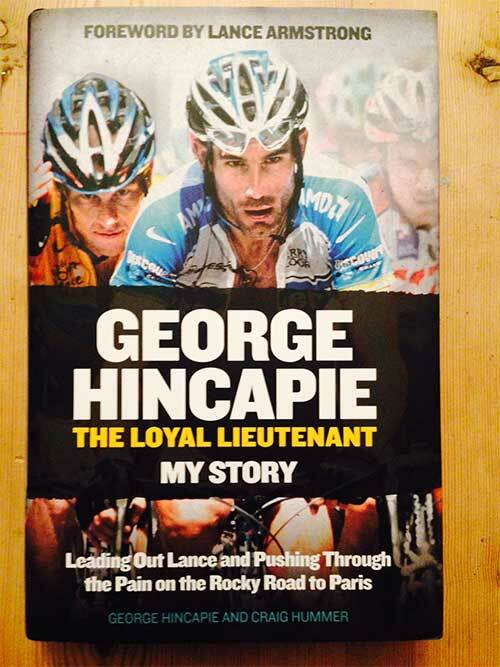 I was given George Hincapie’s biography “The Loyal Lieutenant” for Christmas. It’s one of those books that I’ve seen on the shelves in bookshops and wondered what it would tell us about the inner workings and turmoils of the Lance Armstrong machine. Cards on the table first… I never liked Lance Armstong. Friends & family will tell you that I had my doubts about him well before his outing for doping and subsequent downfall… and you know what, it wasn’t the possibility that he was doping, that was part and parcel of the scene, no it was the way he chose to race. Lance Armstrong chose races that increased his earning potential, which meant the whole ‘machine’ revolved around the Tour De France. While the likes of Pantani, Cancellara and Contador were battling the classics and the other great Tours, riding like proper cyclists, Armstrong just seemed to focus on Le Tour… it wasn’t fair and, by being so focussed on just one event, it felt as though he was cheating, and that was before you factored in the dope. So I’ve got the book and the first thing I see is that the foreword is by Lance Armstrong. That’s interesting I thought, how’s George H going to get away with a warts-and-all expose of the Discovery team, if he’s got the main protagonist giving it a thumbs up? Lance hasn’t gone into print with his story yet, so why would he give tacit approval for George to write the truth, unless it isn’t the truth? In the first paragraph Lance says “Domestique was a word thrown around cycling a lot… I don’t even know how much that term is really used anymore in cycling”… pardon? Sorry Lance but this either shows how out of touch you’ve always been with the rest of the cycling world or you’re a bigger fool than many already believe. Domestique always has been and will always be the perfect cycling term for a workhorse team-mate, something that Lance presumably never chose to notice. Then on page two of the foreword, maybe I should flag a spoiler-alert here (though what’s coming is frankly the obvious that you’re expecting), Lance says “you can’t not talk about that decision that we were all forced to make… Drugs were so prevalent in that era that the decision itself, as our team saw it, was either play ball with everyone else or go home”. I’m sorry, but this was covering same lame excuses that Lance Armstrong has always hidden behind. This isn’t an attempt by Armstrong to start the unpleasant process of coming clean about what happened on his watch and this was the point at which I stopped reading the foreword… two pages and the book looks as though it’s going to be a big fat lie. George, I will give the book a fair chance… you may have been one of Lance’s lackey’s (sorry, should that be domestique? – Lance seemed confused on that term) when you were riding, but I sincerely hope that this book is not a poor excuse to start a new cover-up of the Lance Armstrong story and that you show some strength & tell the truth as it really was… sadly I’m not holding out much hope.